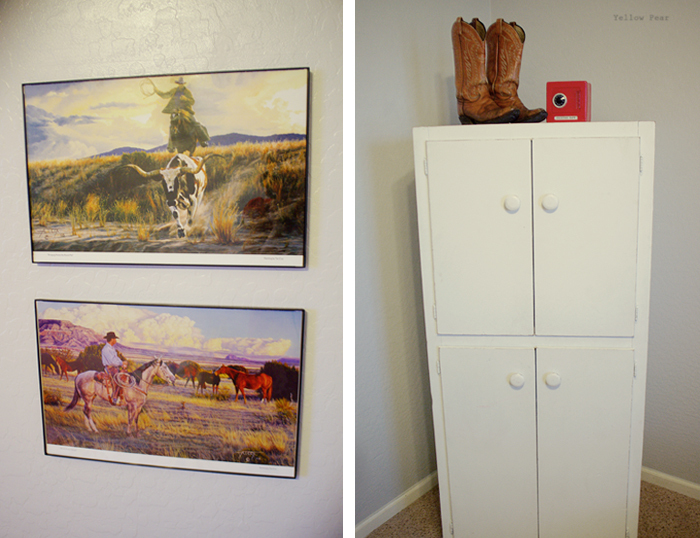 I finally got to the boys' vintage/retro cowboy room that I've been dreaming about for many, many months/years. Dennis and Q share the room and Dennis is a huge cowboy/horse fan. He loves riding horses with his grandpa and has always wanted a cowboy room. 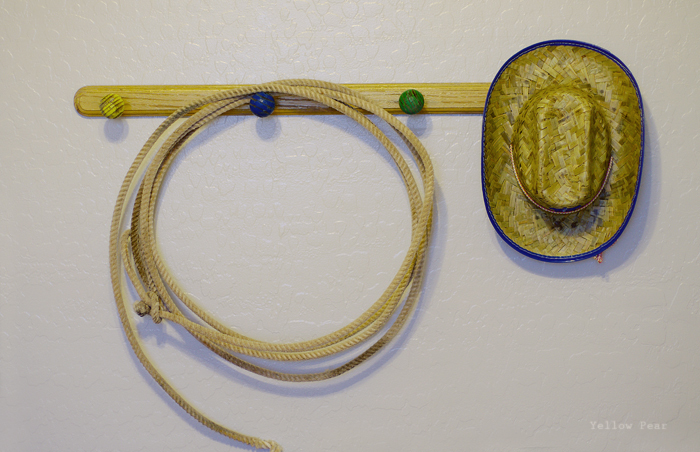 So began the dream of a cowboy room. 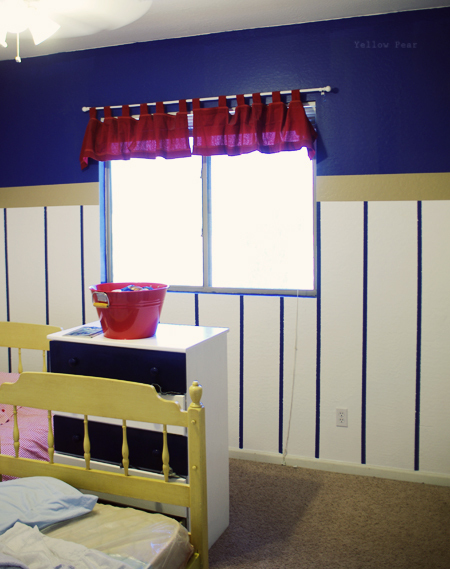 The walls were painted a very dark navy when we moved in and in trying to use what was there, I decided I would paint the bottom portion white, add a tan border and leave some navy stripes on the main wall. Ugh. I should have just repainted the whole room. I have never liked it and it's always been too busy, too dark, too stripey, too Americana, etc. etc. So. First up was paint. I chose a very soft grey and I cannot believe the difference it made in the room. It opened it up so much and made it so light and airy and fresh and crisp and clean and all things that make me smile and sigh. Plus it was neutral enough to let me add some fun colors. Like the nightstand my father-in-law gave me and I painted turquoise. It used to have doors and was so dry and crusty and cracking that I wasn't sure it would ever look good, but after a few coats of spray paint, it gleamed and shone and I smiled. He also gave me a lasso, a pair of his old cowboy boots, a collection of cowboy calendar pages to frame, two trunks...and I think that's it. After I got it all up and organized, I couldn't believe how many items I had inherited from him...but it is very fitting because he is the reason the boys love cowboys so much. 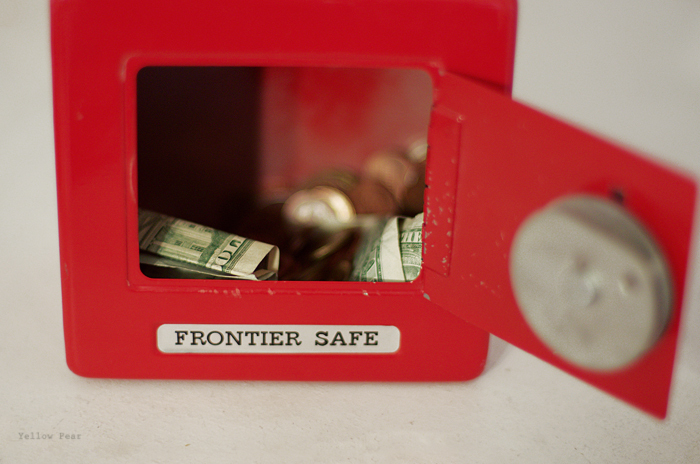 Dennis got the sweet little red "Frontier Safe" for Christmas. It houses his fortune. I scored it at yet another consignment/antique shop last year. The red/white ticking duvets I got at Ikea. I made the dark denim pillows. And just so you know...covered buttons make everything better and more fancy....even if they are very boring buttons that you cover with hot glue and white muslin. Also I did make the curtains, but they are nothing special. They have little buckin' broncos all over with touches of turquoise. I sewed a quick edge on two rectangles and left a gap at the top for the curtain rod. I wanted short panels for a more retro feel and something to frame the window so it wasn't so stark. I've had the old Ethan Allen beds for ages that I got for free from someone moving and purging. The yellow is the original color and they can be made into bunk beds, twin beds, or day beds with a trundle underneath. They are very functional and we've had them for ages, and I love them. 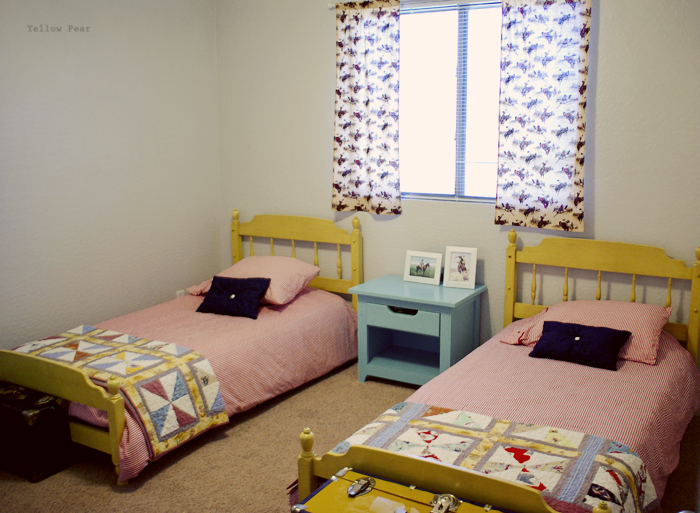 We've had them in many different configurations and used them for both boy or girl rooms. They are so versatile. I bought this peg board at a sweet consignment shop years ago and it's been sitting in my closet waiting for this very day. I was so excited to finally hang it. I have been dying to show these quilts too. Just dying. 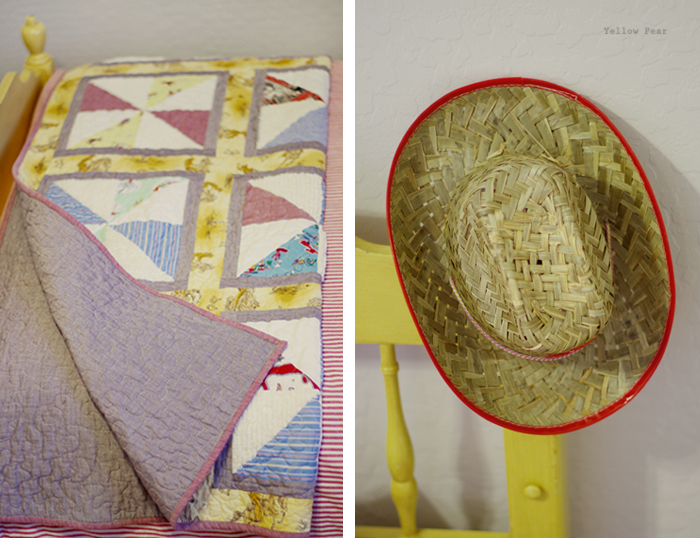 I traded this photoshoot for two fabulous quilts awhile back and I just adore them. I bought some vintage cowboy fabric (real vintage fabric...from the 50'-60's...not just the look-alike stuff...well except the yellow cowboy print...it is the look-alike stuff) from Ebay and sent that, along with some textured grey/brown fabric that she edged the squares and backed the quilts with, and an old red/tan/blue striped shirt of my hubby's that was ripped. Then she created the beautiful lap quilts for me. 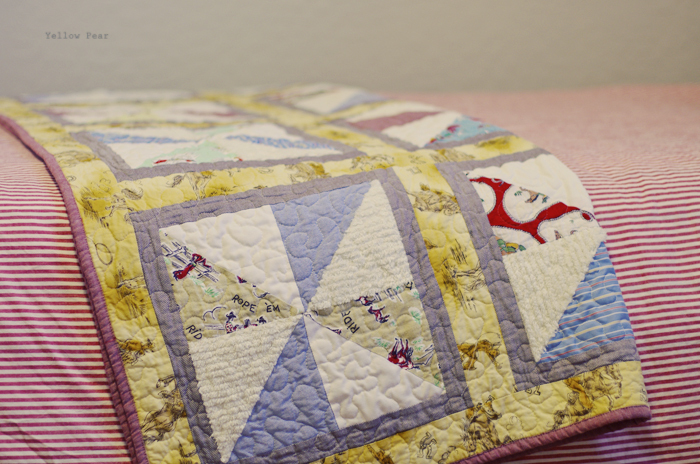 She added a bit of her own fabric to fill in the gaps, like the whites and the red chambray. I love everything about them. I love all of the different cowboy fabrics and colors. I love that they have my hubby's shirt incorporated in them. I love the design she chose. I love the quilted pattern. I love that they are similar but slightly different. Sigh. I just love them. Q walked in when I was done and said, "Oh! Yook at my new yoom. I yuv it!" So that was pretty awesome. Except I guess I'm not quite finished. I have to compile and hang a collage on the big blank wall. 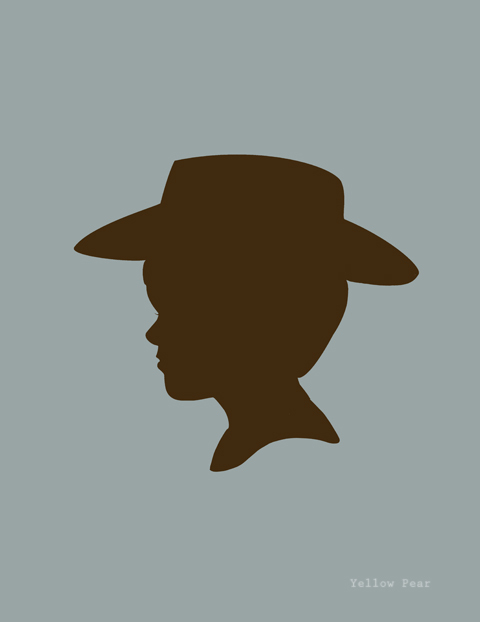 I have a chalkboard with Yee Haw scrawled across it and some cowboy silhouettes of the boys...and some other fun cowboy tidbits. I'll show y'all when it is complete and wonderful. The room looks great and I love the new gray color and the quilts!